The first step in becoming an HMS Net Radio Producer is to schedule an orientation session. Contract Program Director Ronnie Renfrow at ronnier@hmstv.org or (713) 524-7700 x121. During this meeting, Ronnie will develop a customized instruction program that will enable you to bring your programming ideas to life. Orientation available by appointment only. In order to submit content to HMS Net Radio, you must be registered as a producer. The annual fee for radio producers is $100 for an individual and $150 for an organization (additional organizational producers may register at $100 each). 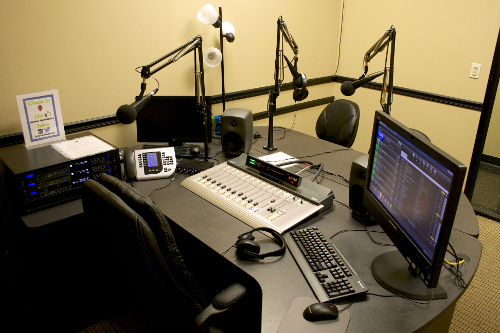 All producers are required to attend a Radio Literacy class ($20), which will cover the specifics of the radio producer’s contract, technical specifications for submissions, and HMS Net Radio rules and regulations. The Radio Engineering class ($50) covers recording and basic audio editing. Advanced Radio Engineering ($50) deals with more sophisticated editing techniques, and On the Air ($50) gives you the tools you will need to run a live radio show. Contact Ronnie Renfrow (see above) for details on all HMS Net Radio classes.